If the human year to dog year ratio is 1-to-7, then human years to bar years has got to be like 1-to-450. You know it’s hard out there for a publican, especially in a city like Philadelphia, where competition can be heavy and tastes can be fickle. There aren’t too many establishments out there that have logged 10 years while remaining relevant to the discourse throughout, but South Philadelphia Tap Room is definitely one of them.When John Longacre opened SPTR at 15th and Mifflin in 2003, immersing himself in beer-bar culture wasn’t even his primary goal. Primarily a developer, he had long been interested in the neighborhood north of Snyder, south of Washington west of Broad and east of 18th — it seemed geographically poised for an influx of new residents and business owners, but was stuck in stasis. Longacre says SPTR was built as a “a social hub for civic activity — [garnering] neighborhood support and pushing initiatives to revitalize the neighborhood.” But it soon opened up into a draw of its own, building a sharp craft-beer approach. The food side of the operation grew a little slower, but it started earning serious looks once chef Scott Schroeder grabbed the wheel in 2008. Nowadays, “we get everything from 21-year-old hipsters to 58-year-old suburban dudes from Jersey,” Longacre says of the clientele. 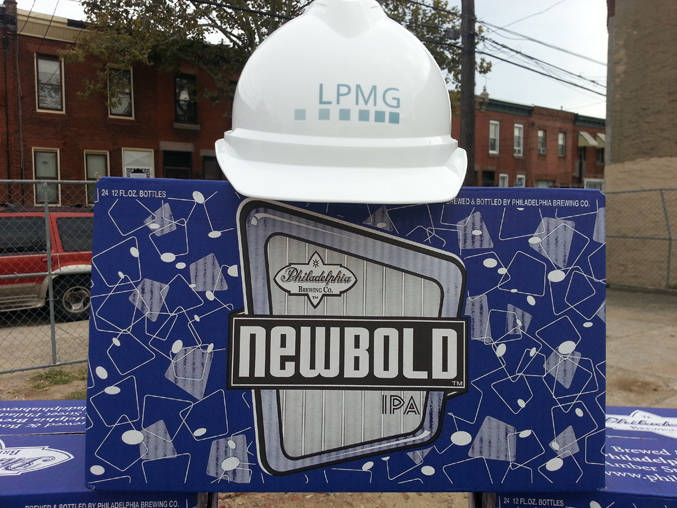 On Wednesday October 16, principles of LPMG, Postgreen Homes, Valley Green Bank, Councilman Kenyatta Johnson, and community leaders gathered to officially break ground at the site of reNewbold. reNewbold, at S. 16th St. and Moore St., is the single largest private investment in the West Broad neighborhood of Newbold in more than 50 years. The development of sixteen rowhomes, two condos, and one retail space is the only South Philadelphia project currently seeking platinum LEED certification. John Longacre, president of LPMG, opened the ceremony by noting the improvement in civic engagement and small business development in the neighborhood over the past decade. This new development of reNewbold will build on the success and significantly improve a site that once contained abandoned homes and an unused school building. The ground breaking ceremony was followed by a community cook out where neighbors mingled to learn more about the development and the LEED certification.